In healthcare, BI isn’t just about BI anymore. A BI platform’s capability and horsepower—traditional hallmarks of large and established BI vendors—are only as good as the insights and outcomes they help create. 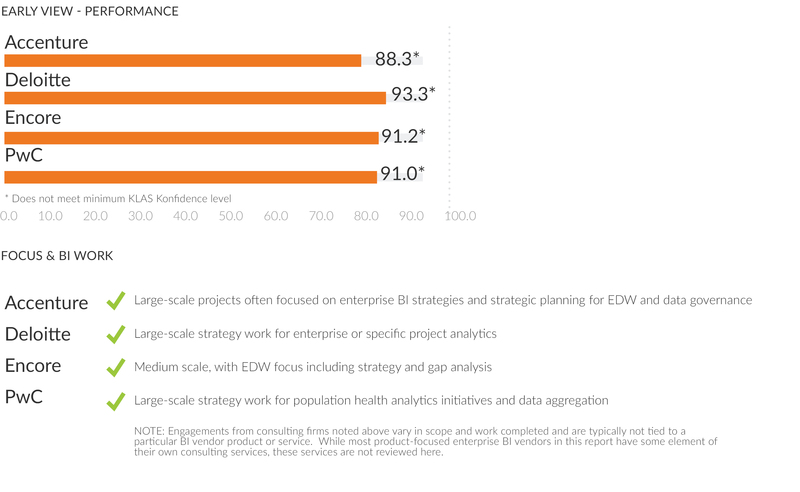 This report differentiates 11 enterprise BI vendors based on client reviews in performance, insights, and outcomes. The focus of healthcare enterprise BI is shifting well beyond products and reporting to insights and outcomes. Health Catalyst and Dimensional Insight lead this shift by embracing a disciplined, holistic approach to help clients achieve analytics victories that would often not be possible otherwise. Health Catalyst, boosted by their clinical leadership and healthcare focus, delivers expertise and high-value clinical outcomes through their EDW product and analytics adoption model. Dimensional Insight serves multiple industries and, with continuous improvement and exceptional customer service, produces strong results for their healthcare client base. While different from each other, both vendors consistently demonstrate a high-touch, consultative approach, using their products as facilitators of engagement and deeper work. While visual data-discovery capabilities are now common among BI vendors, Tableau, McKesson, and Qlik stand out in healthcare adoption and real use cases. Qlik helped pioneer visual analytics in healthcare, and although overall client satisfaction has slipped, Qlik remains a strong choice. Tableau captures significant healthcare customer mindshare in visual data discovery and is growing fast; clients appreciate the simplicity of the product. McKesson, a newer player in this area, creates excitement with their early Explorer Analytics client base, who reports strong satisfaction with the product coupled with McKesson’s healthcare expertise. The largest cross-industry vendors have multiple similarities: They are (1) seen as having the most complete BI portfolios, (2) viewed as having the most complex platforms, and (3) often considered most by the largest healthcare organizations. SAS is used frequently in research and academic environments and, although seen as expensive, has a high prevalence of superusers who drive strong results for insights and outcomes. Viewed as more affordable for BI, Microsoft and Information Builders offer products with average overall performance, with some clients reporting challenges with a handsoff vendor approach. While IBM and SAP have a large healthcare footprint, their BI products—IBM Cognos and SAP BusinessObjects—are largely seen as aging and sometimes even stagnant, with many clients reporting a lack of vendor support/relationship attention. Oracle’s relatively small BI client base is invested and has high future expectations, but clients struggle greatly with product complexity and subpar support. Over the past 12–18 months, KLAS has seen healthcare BI consulting work grow as clients seek firms with deep industry expertise and an objective view. KLAS validated early performance for four consulting firms doing BI advisory work. Accenture’s and Encore’s engagements provide strategies for EDW and data governance. Accenture engages with very large health systems on long, complex engagements, while Encore’s shorter engagements often involve midsize to large hospitals. Meanwhile, Deloitte and PwC demonstrate early capabilities with both overarching BI strategies and those centered on specific initiatives. These engagements can vary from shorter contracts to multi-year strategic partnerships, and both firms mostly work with large health systems. 5. FUTURE LOOK: BIGGEST EHR VENDORS CERNER AND EPIC KEY PLAYERS IN HEALTHCARE ENTERPRISE BI? Enterprise BI is far more difficult than most healthcare clients anticipate, and the product complexity they encounter with some cross-industry BI platforms (IBI, IBM, SAP, Oracle) often invites consideration of other options. The need for simpler solutions has already led to adoption of solutions such as Qlik and Tableau, and the search is not over—clients are increasingly drawn toward enterprise vendors Cerner and Epic. Clients using Epic’s EHR are interested in the steady development of Cogito and integration of analytics into the clinical workflow; Cerner clients’ energy stems from Cerner’s new healthcare platform and strong vision for HealtheIntent. Future Look: Biggest EHR Vendors Cerner and Epic Key Players in Healthcare Enterprise BI?